Coupe comes coated in 27,000 pieces of chocolate. We’ve gotten used to seeing cars covered in various everyday objects, from a Range Rover coated in coins to a popcorn-covered Golf. 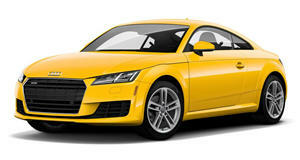 But this Audi TT is the sweetest of the lot. Created for the 24th international interior fair in Belgium, Audi teamed up with chocolatier Joost Arijs, who painstakingly applied 27,000 pieces of chocolate onto a third-gen TT Coupe. We’re a little puzzled as to what a car, or chocolate for that matter, has to do with interior decoration, but it’s not something worth dwelling on. Check out the chocolate-coated TT here and listen to the car’s exterior design boss discuss the philosophy behind the latest generation’s styling.